It is recommended that when assembling a rear axle assembly or when installing axle shafts that the bronze bushing in the differential bearing support and the journal area on the axle shaft be lubricated thoroughly with the standard hypoid rear axle lubricant. This will insure sufficient lubrication to prevent damage to the bushing during the first few miles of operation where the bushing would be dry if this were not practiced. During the installation of propeller shaft to front “U” joint, it is very important that the hole in the spline of the propeller is aligned with the mark on the “U” joint to insure that “U” joints are 90° apart. See Figure 58. If these “U” joints are not aligned properly, they will cause a severe vibration which will be more noticeable on heavy acceleration. We have been advised by our Engineering Department that a rubber “square cut” ring, Gr. 5.442 Part #1181614, has been released for use between the rear of the front propeller shaft and universal joint at bearing location. See Figure 59. This rubber ring acts as a cushion to eliminate rattle of propeller shaft against the rear universal joint on acceleration and deceleration, or when shifting from forward to reverse. Install ring, Part #1181614, over splines of rear coupling and against face of rear coupling on front propeller shaft, coat splines with type “0” grease, then reassemble front and rear propeller shaft assemblies and drive lock pin in place. On installation, in case of close limit assembly, force may be required to compress the ring. This can be applied by inserting a small drift or punch as a lever to line up the holes. An Engineering change is in process to improve the grease retention in the spline coupling of the rear propeller shaft. This change will affect 1957 afterjobs. On early production cars or replacement parts, the following operations may be performed to improve the grease retention. However, since production uses two sources of rear propeller shafts (Saginaw and Spicer) two different steel washers are used. Drill a 1/16″ diameter hole in the plug located at the bottom of the spline coupling and another 1/16″ diameter hole in the tube. These holes act as vents to prevent pressure build-up which forces grease out. Remove the seal retainer and install an .029″ thick steel washer which measures 1.980 “O.D. and 1.220” I.D. between the seal and the retainer, to be released under Gr. 5.442, Part #5672246. Before reinstalling the seal, washer and retainer, use a sealing compound similar to Permatex on the sealing face and on the O.D. of the coupling. Re-stake the retainer all around to prevent grease from leaking past the forward end of the retainer. The seal should be snug against the coupling end. Sec Figure 60. Drill a 1/16” diameter hole in the plug located at the bottom of the spline coupling and another 1/16” diameter hole in the tube. Remove the seal retainer and install a .029″ thick washer which measures 1.900″ O.D. and 1.220″ I.D. between the seal and the retainer, to be released under Gr. 5.442, Part #1179324. 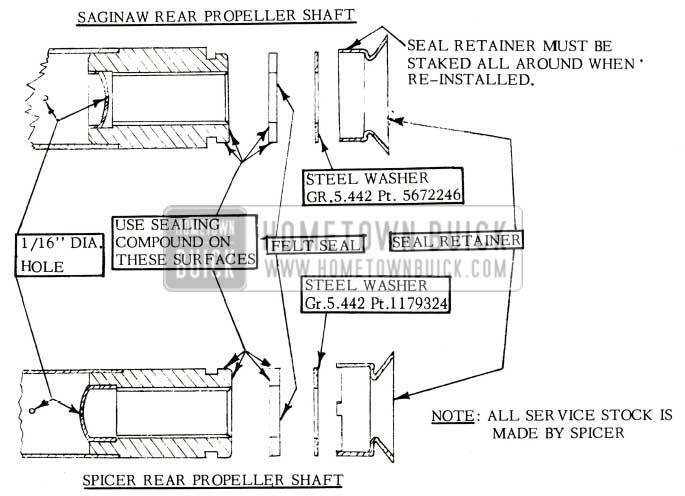 Reinstall the seal, washer and retainer and restake the retainer in four places. Spicer retainers are press-fit on the coupling. However, use of sealer compound is recommended as above to avoid leak around O.D. of seal. NOTE: All service stock of rear propeller shafts are made by Spicer. Figure 60 shows the difference between the two shafts. 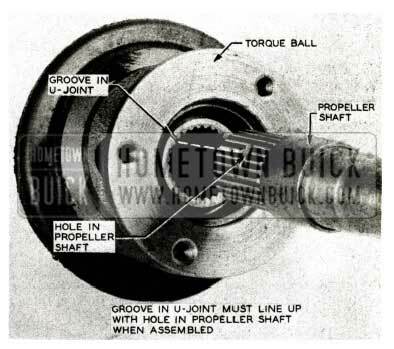 These operations are not recommended for rear propeller shafts in which the coupling spline is worn out. The operations should be performed on the replacement shafts until such time as replacement shafts incorporating these changes are furnished. We have received a number of Product Reports stating that the rear axle oil level was found to be below the filler plug opening on 1957 models. In the past, it has been our recommendation that the oil level be maintained to the bottom of the filler opening such as on 1955 and 1956 models. However, the design of the 1957 rear axle has been changed by the use of the two-piece torque tube and propeller shaft to obtain lower car height. In doing so, the axle housing was rotated forward approximately 5°, causing the filler opening to be slightly higher than on past models; this is the reason why fluid is found to be below filler plug opening on 1957 models. To prevent over-filling of rear axle on 1957 models, the lubricant level should be from 1/4 inch to 3/8 inch below the filler opening. On 1955-56 models fluid level should be maintained as previously mentioned. 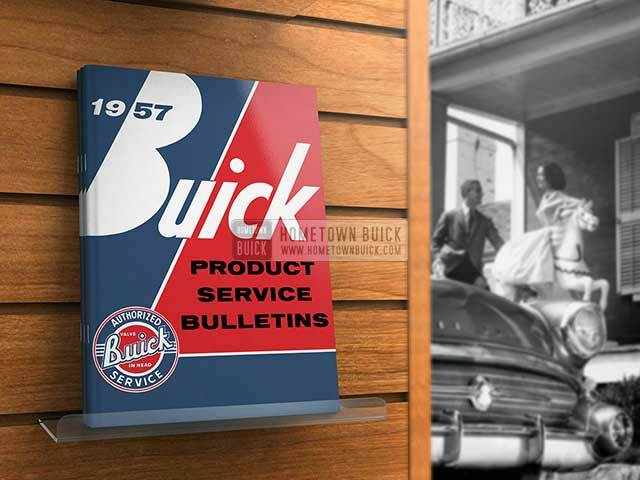 1957 Buick Tools & Misc.